Not to be confused with Khaldi (people). Ḫaldi ( d, Ḫaldi, also known as Khaldi or Hayk, Armenian: Խալդի) was one of the three chief deities of Urartu (Ararat). His shrine was at Ardini (Muṣaṣir). The other two chief deities were Theispas of Kumenu, and Shivini of Tushpa. Of all the gods of the Urartian pantheon, the most inscriptions are dedicated to Khaldi. 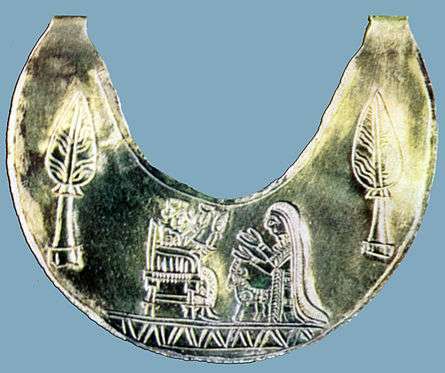 His wife was the goddess Arubani. He was portrayed as a man with or without wings, standing on a lion. Khaldi was a warrior god whom the kings of Urartu would pray to for victories in battle. The temples dedicated to Khaldi were adorned with weapons, such as swords, spears, bows and arrows, and shields hung off the walls and were sometimes known as 'the house of weapons'. Khaldi's temple in Erebuni, 782 B.C. ↑ Авдиев В. И. "История Древнего Востока", М.: "Высшая школа", 1970, с. 419 420. ↑ Ernest René Lacheman, Martha A. Morrison, David I. Owen, General studies and excavations at Nuzi 9/1, 1987, ISBN 978-0-931464-08-9, p. 50f. ↑ "Haldi | ancient god". Encyclopedia Britannica. Retrieved 2015-11-25.